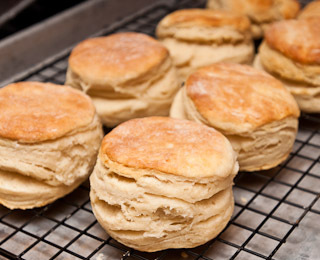 I like my biscuits complex in flavor, fluffy in texture, and to separate into layers. That's what I set out to accomplish when I put together this recipe and I think I've done a pretty good job on each of those points. The key to these biscuits is the use of lard. I use leaf lard rendered from the kidney fat of pasture raised Berkshire pigs. The lard is unhydrogenated and has no additives and features a clean, almost sweet, taste. Frying with this lard and making pastries with it adds a delicate, pleasant flavor that the supermarket lard (in my area the only brands available are Armour and Farmer John which are both partially hydrogenated and taste very "porky") just cannot match. If high quality lard isn't available in your area, I recommend substituting the lard in this recipe with butter. The biscuits will be a little chewier, but the butter flavor will be more pronounced (but will lack the subtle flavors that lard contributes). I'm not a fan of using vegetable shortening even though the texture will be better than using all-butter, because it contributes no flavor. The ingredients are simple: 2 cups (280 g) all-purpose flour, 1 cup (235 mL) buttermilk, 2 ounces (55 g) leaf lard, 2 tablespoons (28 g) unsalted butter, 1/2 teaspoon (3 g) table salt, 4 teaspoons (18 g) baking powder, and 1/2 teaspoon (2.3 g) baking soda. 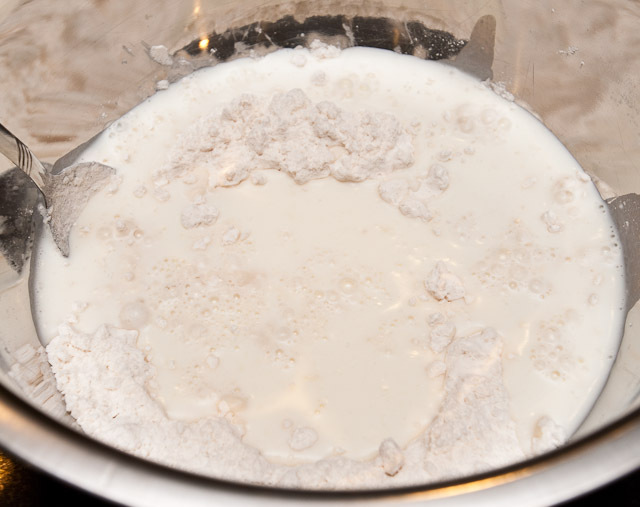 If you don't have any buttermilk, you can just substitute 1 cup (235 mL) milk for it. Or 1 tablespoon (15 mL) lemon juice with enough milk to make one cup (235 mL) which has been allowed to sit for ten minutes. 1/2 cup (120 mL) plain yogurt and 1/2 cup milk also works well as does 1/2 cup yogurt. When I don't have buttermilk, I just use milk but if any of these other ingredients are available, they're just as good (some prefer yogurt over buttermilk - but if I did that, I'd have to change the name of the recipe). 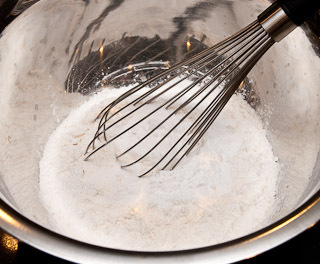 In a mixing bowl, mix the flour, baking powder, baking soda, and salt together until well combined. Add the butter and lard to the flour and cut it in until only pea-sized or smaller clumps are visible. I accomplish this by tossing the flour around the fats until they are fully coated. Then I start to cut and press them using a spoon or knife. 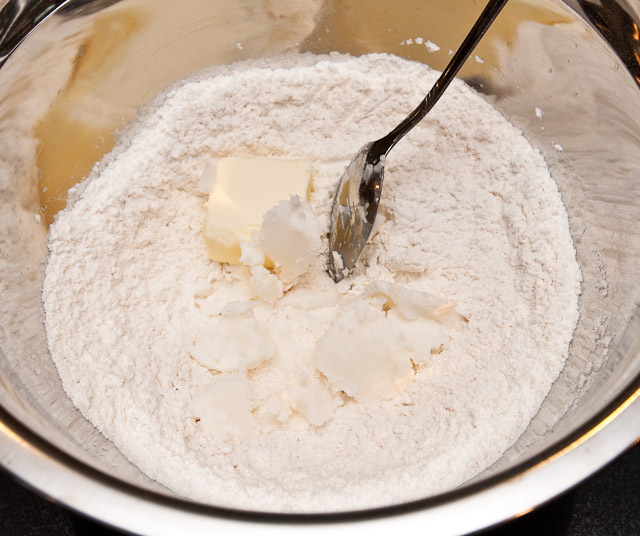 While cutting, I stir to keep the pieces coated with flour. Here's what it looks like when the fats have been cut to the proper size. 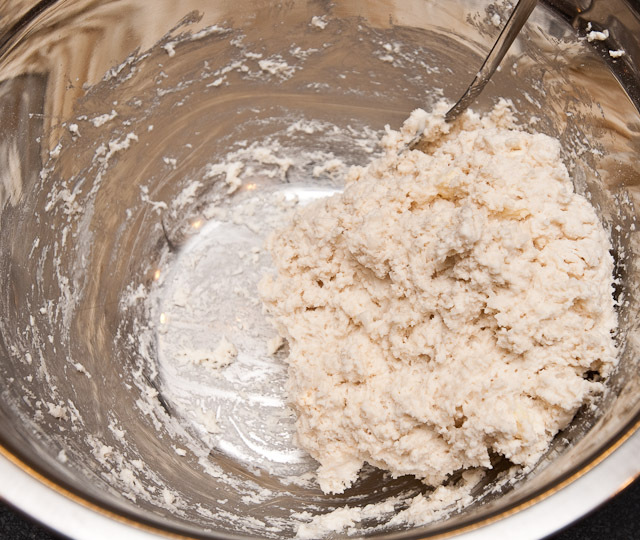 Pour the milk into the flour mixture. Stir with a spoon just until all the flour is wet and it starts to clump together. 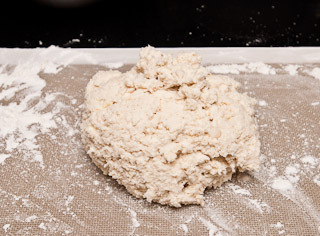 Prepare a surface for rolling out the dough. 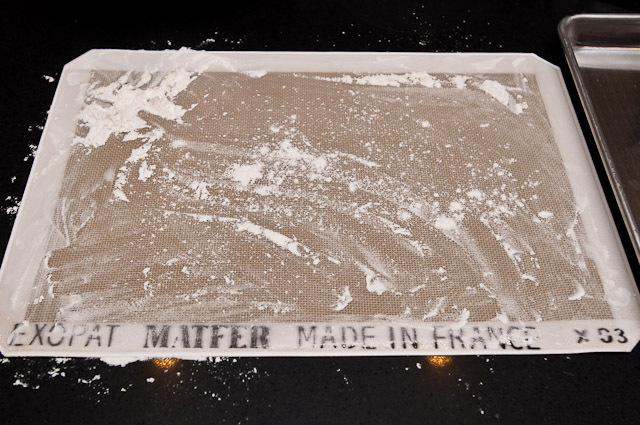 I prefer a silicone baking mat that has been dusted with flour. This is also a good time to preheat the oven to 450°F (230°C). 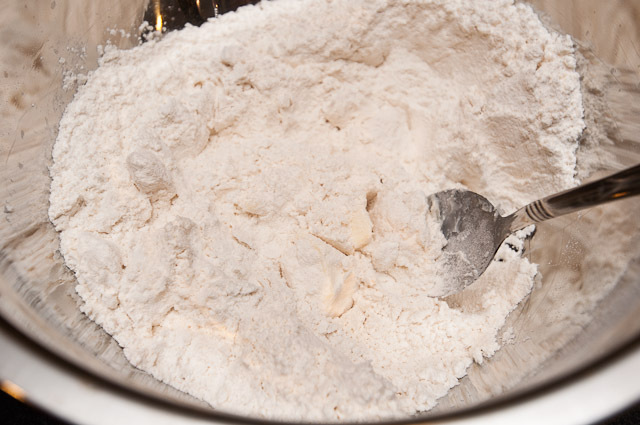 Roll the dough from the mixing bowl onto the floured surface. Dust your hands with flour and sprinkle flour on the exposed surface of the dough (which will be quite tacky at this point). 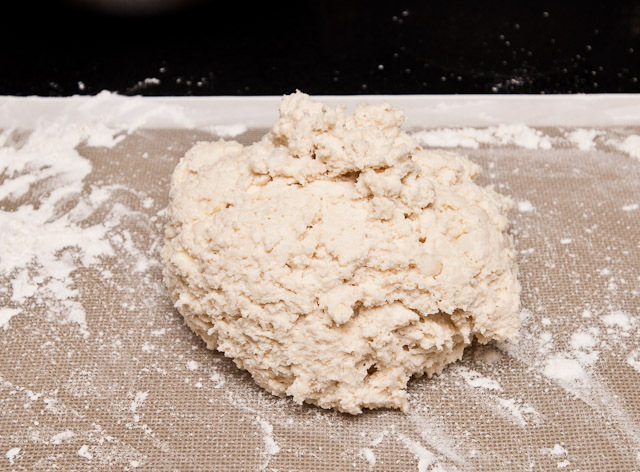 Covering the hands with flour and dusting the dough will make it easier to work with. 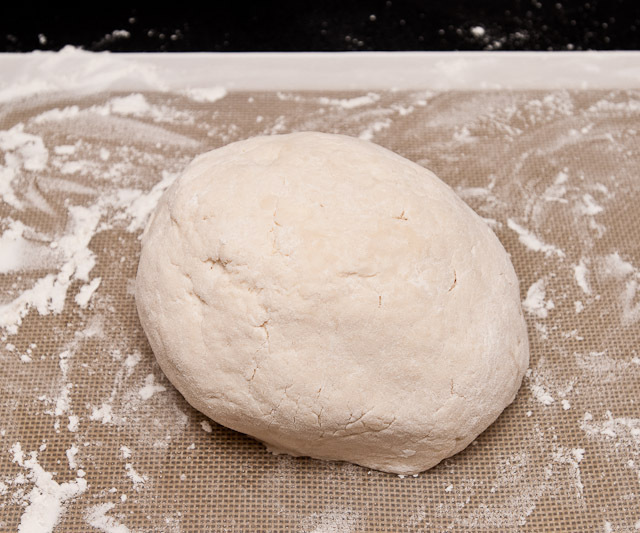 Don't be afraid to continue adding flour to the surface of the dough if it gets tacky to the touch. Without overworking the dough, form/roll it into a ball. Roll it over and flour the bottom if it is tacky. 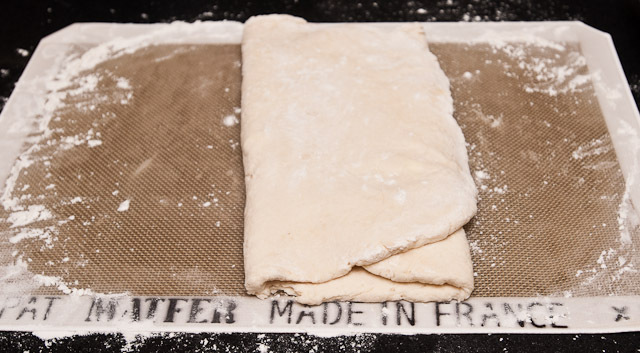 Use a rolling pin to roll out the dough into a large rectangular shape. 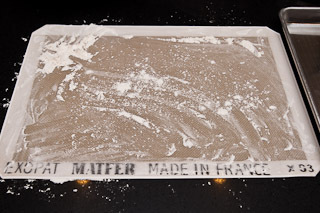 Lightly dust the surface with flour. 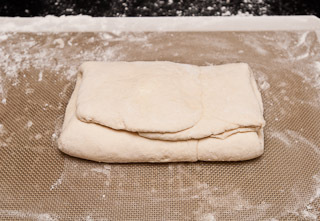 Fold the dough in thirds in the other direction (perpendicular to the direction of the previous folds). Press and shape the dough into a rectangle about 1 inch (25 mm) think. Using biscuit cutters, cut rounds out of the dough. 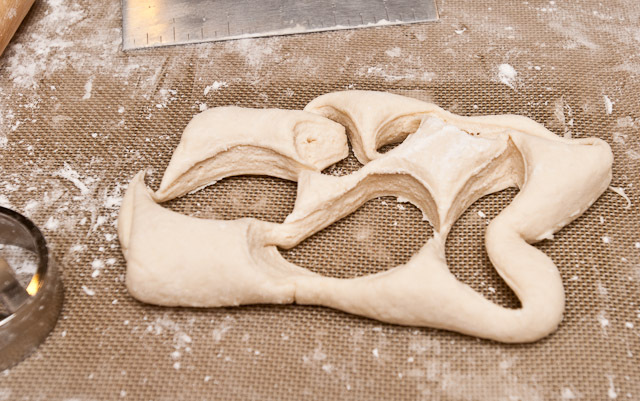 Make sure each round has a circumference that is cut dough (that is, we want to make sure the cutter actually presses through the dough on all sides; an uncut edge won't rise as well as a cut edge, so we want to make sure the whole circlue is cut). Pressing straight down with the biscuit cutter helps make clean cuts which allow for even rising. If you twist/rotate the cutter while pressing down, that can cause the edge of the biscuit dough to "pinch" on itself which inhibits rising on the edges (and thus less overall rise). 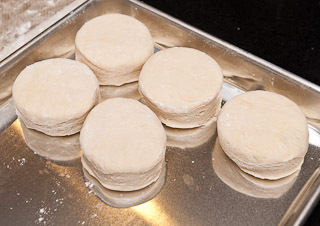 If you don't have biscuit cutters, cut the dough into squares with a sharp knife after trimming the edges off (the edges won't rise easily). 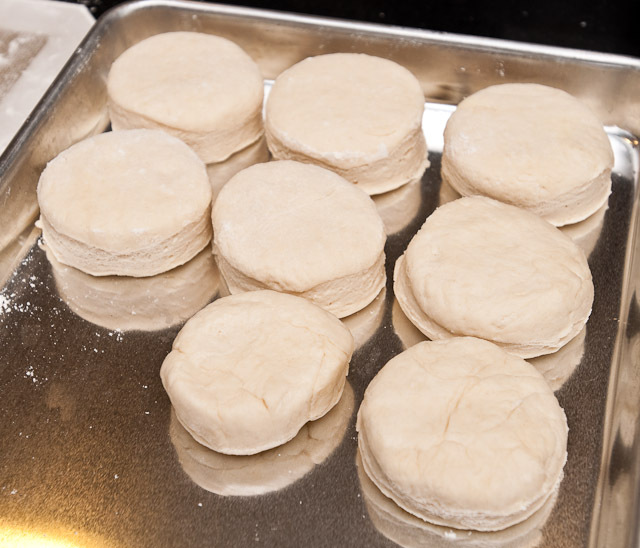 As you cut biscuits, place them directly on a baking sheet pan. Place them close together, either just touching or about to touch. If they touch, it will help them rise but you'll need to pull them apart after they've been baked. Scraps left over from the cuts can be pressed together and rerolled to make more biscuits, but these biscuits will be denser than the first group. 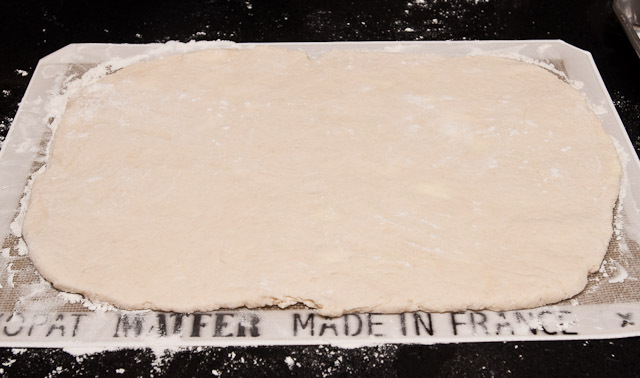 Continue to line you baking pan until you've used all the dough. With my large biscuit cutters and this recipe, I make eight biscuits. Bake at 450°F (230°C) until risen and golden brown - about 15 minutes. The recipe is called "Southern Buttermilk Biscuits" to differentiate them from the hard cookies also called biscuits or certain types of crackers of the same name. I struggled with the volumetric measurement of flour for this recipe (as I do with all my baking recipes). The correct amount of flour to use is 280 g, but what volume do I provide for readers without a scale and rely on measuring cups? 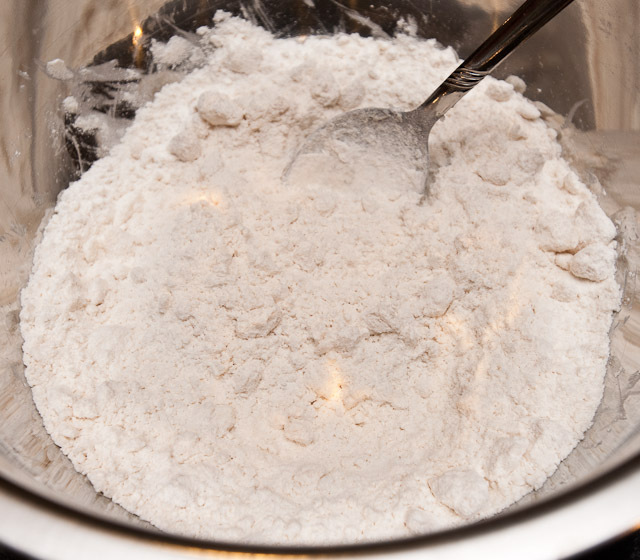 In my experience, a bag of flour that has been sitting in the pantry can range in density from 150 g per cup to 185 g per cup (it can be more if you lightly tap the flour bag against the counter over and over to compress the flour). Freshly sifted flour can weigh 125 g per cup or less (125 g is the official USDA mass for 1 cup of all-purpose flour). In theory, one should use the 125 g per cup measurement because that's the only non-variable when it comes to flour. If you sift the flour well (let's say three times), then scoop your dry measuring cup into the flour and level it, it will be very close to 125 g. However, it's not reasonable to assume that the home cook will freshly sift their flour every time a recipe calls for flour. What do people do? 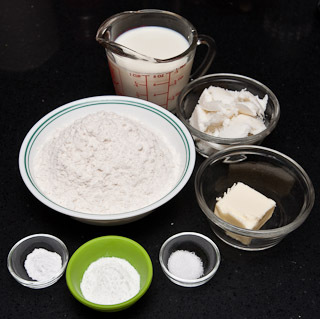 They grab their bag of flour, scoop the measuring cup in, and level it. More often than not, when I do that, it comes in at around 160 g per cup. So, on several recipes I use that measurement. Initially, when I wrote this recipe, I based it on the 160g per cup measurement (so I had 1-3/4 cup flour), but while researching baking recipes I keep finding authors using 5 oz per cup as the conversion: 140 g per cup of flour. I found that I could get 140 g in a cup if I first used the measuring spoon to loosen up the flour (scoop, drop, scoop, drop, stir) and then scoop, level, and measure. Sifting results in too little flour per cup, not doing anything results in too much flour per cup, but playing with the flour first seems just right. So, this recipe uses the 140 g per cup conversion factor. If you're in the Austin area and looking for an excellent source for leaf lard made from local pastured pork, try Dai Due. Jesse Griffiths renders the pork fat from Richardson Farms hogs. Sometimes calling local pastry shops or butchers can reveal sources to local leaf lard sellers or renderers. I'm also moving the old biscuits recipe from the Recipe File to Test Recipes. If we don't have lard and want to substitute butter, do you suggest using the same weight of butter as the lard? Yes, just use 6 tablespoons (3 ounces) of butter instead of the lard and butter combination. Boccalone (Chris Cosentino's salumeria) in the Ferry Building stocks rendered pig fat regularly at $10 for one pound. I just called and it isn't pure leaf lard; the lard is rendered from the fat of all different parts of the hog, but it might be good enough. Just don't use the supermarket stuff - it's nasty tasting and probably contains trans fats. They did tell me that Prather Ranch (the meat guys also in the Ferry Building) occasionally stocks pure leaf lard, but it's probably something you'll need to call ahead and ask about since it's only once in a while that they have it. Seems to me I once got good lard from that butcher at the end of Church Street, end of the "J" line. That was five or six years ago, so I don't know if he's still in business. I always use 135g AP flour per cup as my starting point for converting recipes when I do not know the method used by the recipe writer to scoop the flour. In general I'd rather have a little less flour in a recipe than too much. Especially when a recipe calls for multiple cups of flour and your conversion factor has more impact. 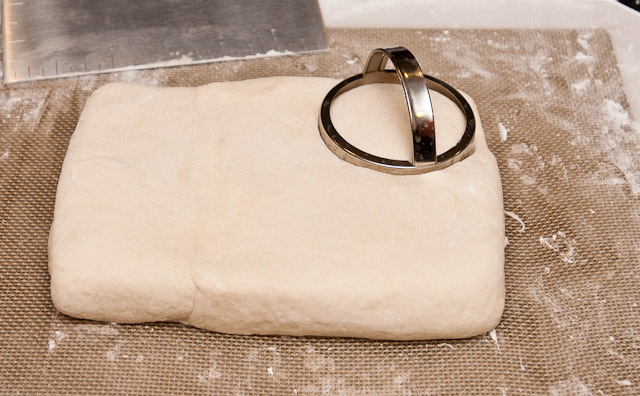 What is the diameter of the biscuit cutter? What are the approximate length and width of the first rolled layer? My large biscuit cutter is 3-in (75 mm) in diameter. The first rolled layer (the thin one that I roll out completely before the two business envelope folds) is about 11-in x 16-in (280 mm x 405 mm). I guess the folding is what gives you the flaky look where they split as they rise? I have been buying rendered lard (leaf lard, the best) from Dietrich�s Meats & Country Store, http://www.dietrichsmeats.com/index.htm . Last purchase was $41.50 including shipping for 10 lbs lard. It's wonderful and last (me at least) a long time. As a "older southern lady" it interested me to read your recipe and how you went about it. There is an instrument for Cutting in.. called a pastry blender i believe. Probably as hard to locate as lard in some areas :) Also if one does not have a pastry blender, holding 2 butter knives side by side will work better & faster than a spoon. and... I would cut in whatever shortening that I was using, a bit finer. Is the pastry blender the tool that looks like a handle with four or five half circle wires or metal strips looping out of it? It might be mine, but I find that I'm faster with a spoon than my pastry cutter. I also find the two knives technique a bit awkward, but I also haven't had much practice with it. Those are absolutely the most gorgeous things ever. Besides the density issue when converting flour weights to volumes, one also has to consider humidity. I need much more liquid to make my biscuits in my arid climate (especially in winter) than I used when I lived at humid sea level. I've also read that the wheat variety and quality used to make one's flour can effect both density and moisture content. 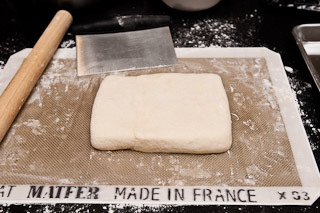 So don't obsess about "correct" conversions - learn to do adjust your ingredients to achieve the correct dough texture. Lovely biscuits. I'm sure they are delicious. My mother always insisted that her biscuits had to be made using White Lily Flour and Crisco for the shortening. She cut the shortening into the flour using her fingers. The results were wonderful biscuits. I was never able to master the art of cutting the shortening in with my fingers. I prefer the pastry blender. I don't thing it matters much which technique you use: it's the result that counts. It cost $39.00/5# plus shipping. The surprise was that the leaf lard was the unrendered lard. So, I have now learned how to render lard! It was actually very easy (low and slow) in my crockpot. I now have lots of snowy white leaf lard to make biscuits, pie crust, etc. Since I was paying shipping anyway, I ordered their Berkshire pork chops. So now I am in heaven. Michael turned me onto leaf lard for pie crust. It's wonderful stuff. It's quite a bit cheaper to make at home if your butcher can get it. Good recipe. I don't use biscuit cutters, just cut the large rectangle of dough into a grid of smaller rectangles - it's easier and all biscuits are equally light in texture. I love your site and full proof formulas. Question? 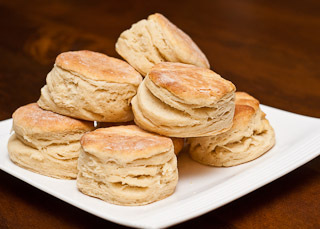 Is there anyway you could create a similar formula for a Southern Sweet potato buttermilk biscuit? Is there anyway you could create a similar formula for a Southern Sweet potato buttermilk biscuit? I was taught by a country lady who didn't go to a store for umpteen years. Her kids never had a soda or loaf bread. They lived with whatever they grew, raised, or butchered on their farm. She did use lard and buttermilk. Everything was done by hand. No pastry cutters, biscuit cutters, rolling pin, or anything. Melt in your mouth perfection. Takes less time than some ways once you get the hang of it. She always made me hot biscuits when I walked in her home. She was my sister's mother-in-law who treated me like family. Sure.miss the old way of cooking. I am from Texas and am an experienced southern cook/baker. I used this recipe with a friend in Denmark who wanted to learn how to bake biscuits like he had tasted in the South. This recipe turned out perfectly...very light and flaky layers. Thanks! I LOVE this recipe. I live in an area with a lot of resources, so I have leaf lard available nearly all the time to render my own. 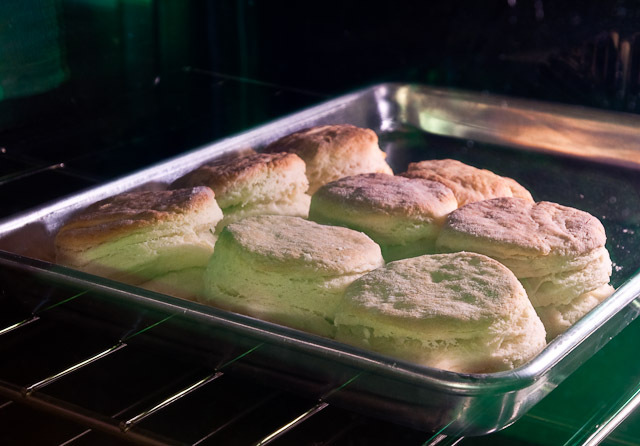 The first time I made these biscuits, they rose so high that I was concerned they were going to hit the top rack in my oven. Your website was down yesterday when I came looking for the recipe, and I was VERY upset, as I had to use another recipe that's far inferior. Glad to see you are back up, and this recipe is going immediately into my favorite aggregator, Pepperplate.